B phase during cooling was also reported and discussed. 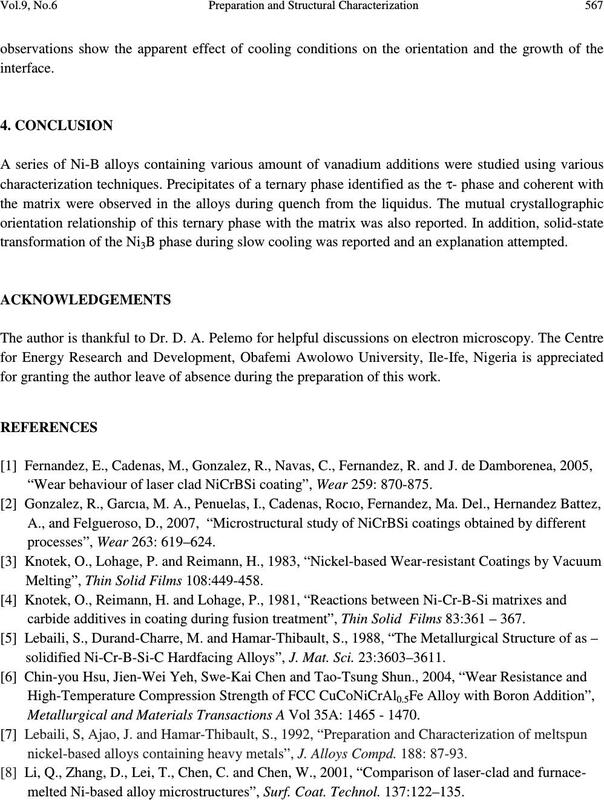 Keywords: Alloy, Solidification, Microstructure, Solid-state transformation. alloys cannot be overemphasized. However, only few works report their microstructural features [7, 8]. 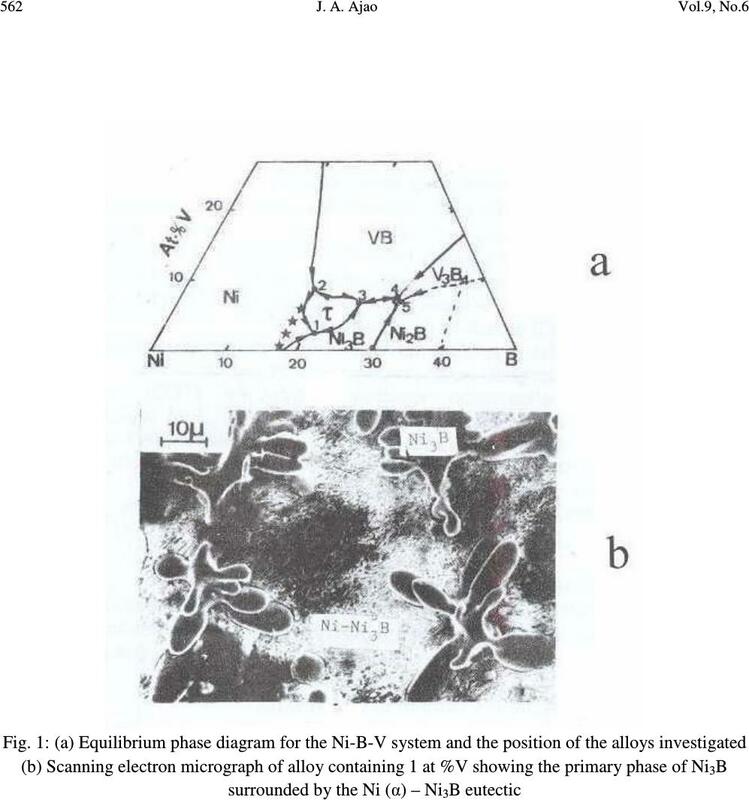 the Ni-B-V system and the position of the alloys investigated. 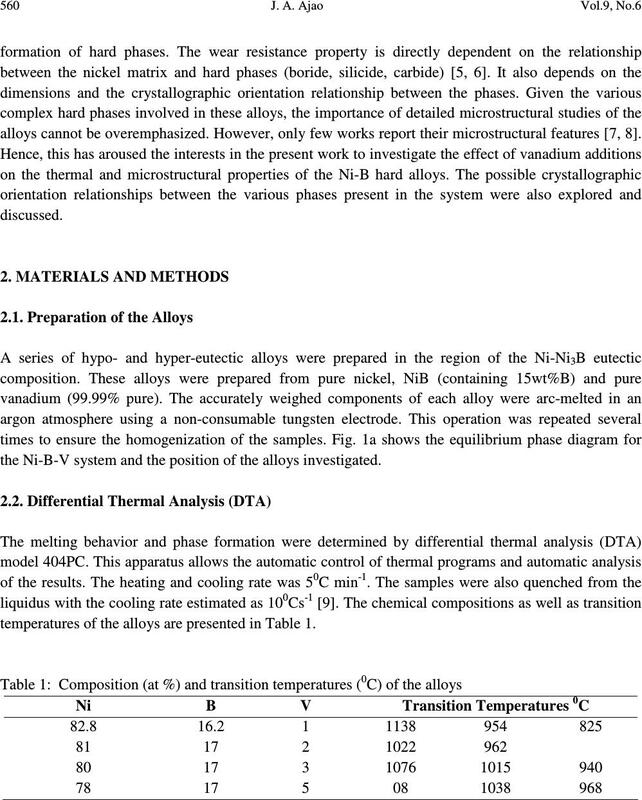 temperatures of the alloys are presented in Table 1. A certain number of alloys with varied compositions of vanadium l at % < V < 5 at % were prepared. 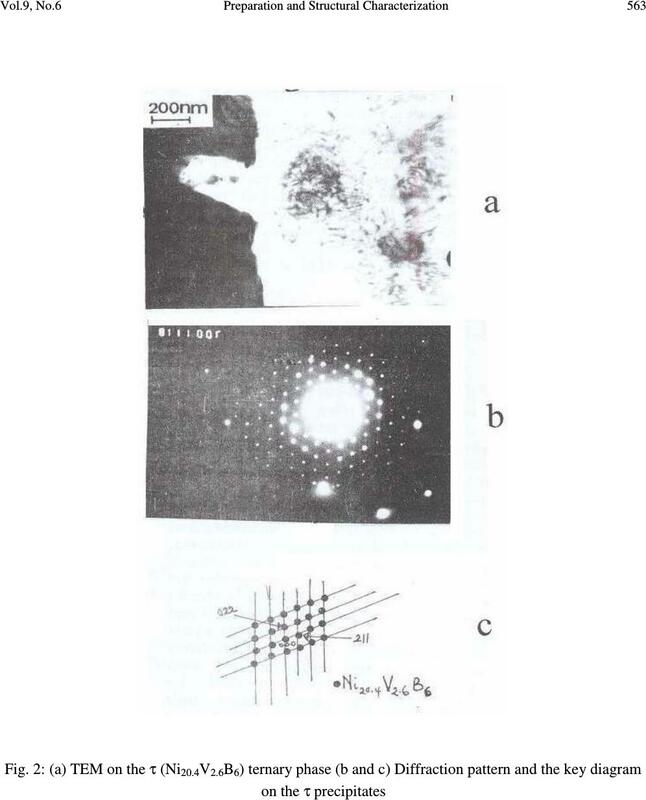 present the diffraction pattern and the key diagram on the precipitates respectively. in Ni-B-Si  and Ni-B-Ti [12, 13] systems. nickel. Hence the domain of existence of the ternary phase τ (Fig. 1a) is much more reduced. transmission electron micrograph of Fig. 3a. C as shown in Fig. B phase during slow cooling was reported and an explanation attempted. for granting the author leave of absence during the preparation of this work. “Wear behaviour of laser clad NiCrBSi coating”, Wear 259: 870-875. 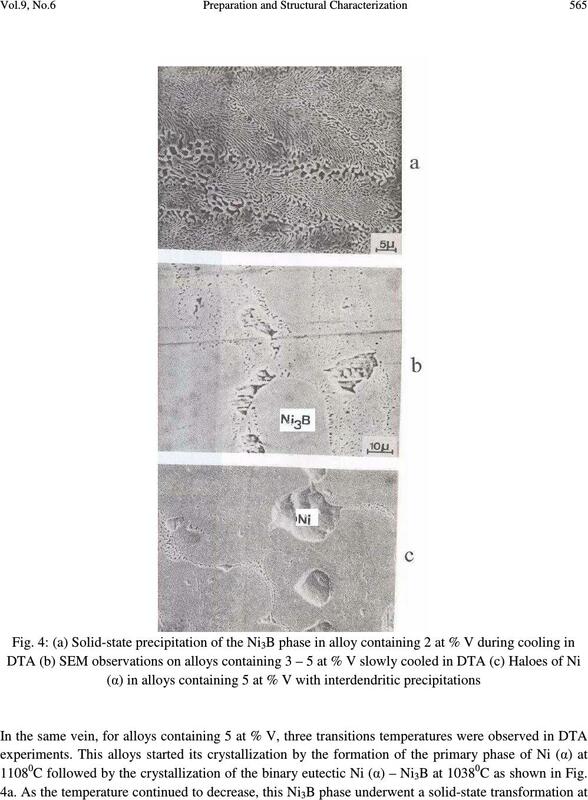 Melting”, Thin Solid Films 108:449-458.
carbide additives in coating during fusion treatment”, Thin Solid Films 83:361 – 367.
solidified Ni-Cr-B-Si-C Hardfacing Alloys”, J. Mat. Sci. 23:3603–3611. 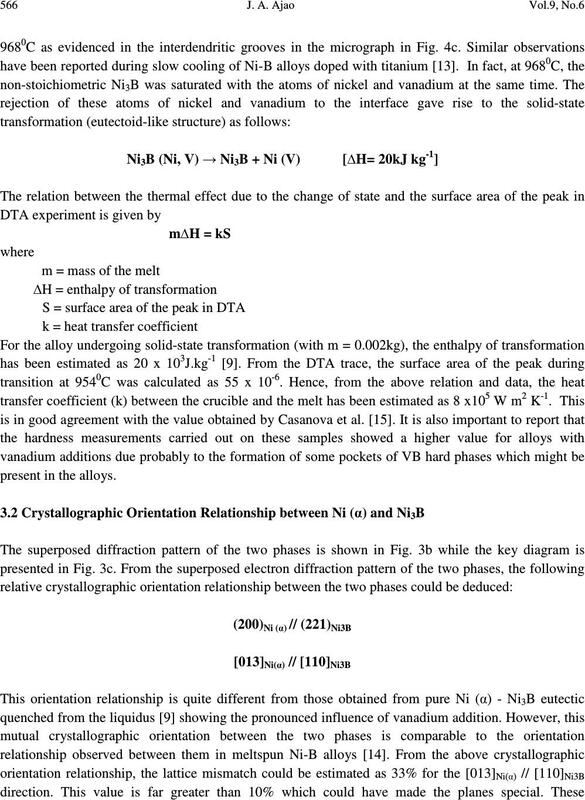 Metallurgical and Materials Transactions A Vol 35A: 1465 - 1470.
nickel-based alloys containing heavy metals”, J. Alloys Compd. 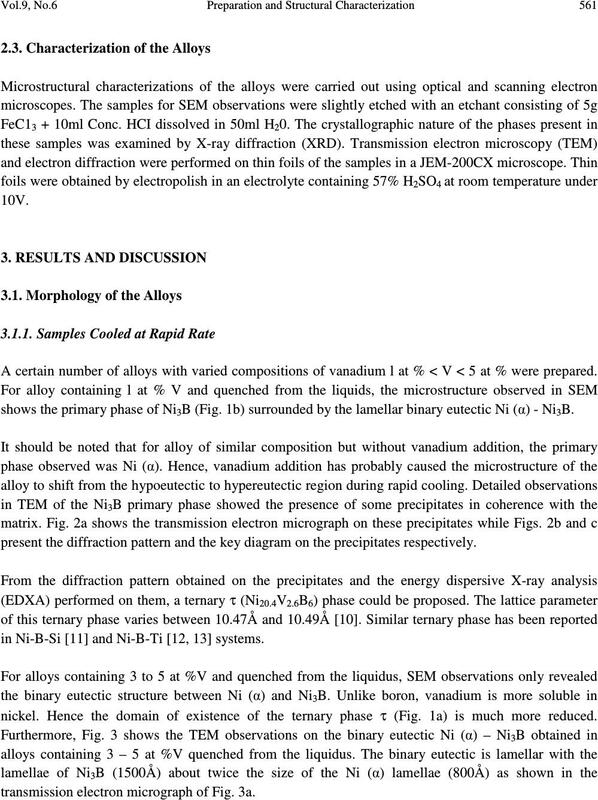 188: 87-93.
melted Ni-based alloy microstructures”, Surf. Coat. Technol. 137:122–135. 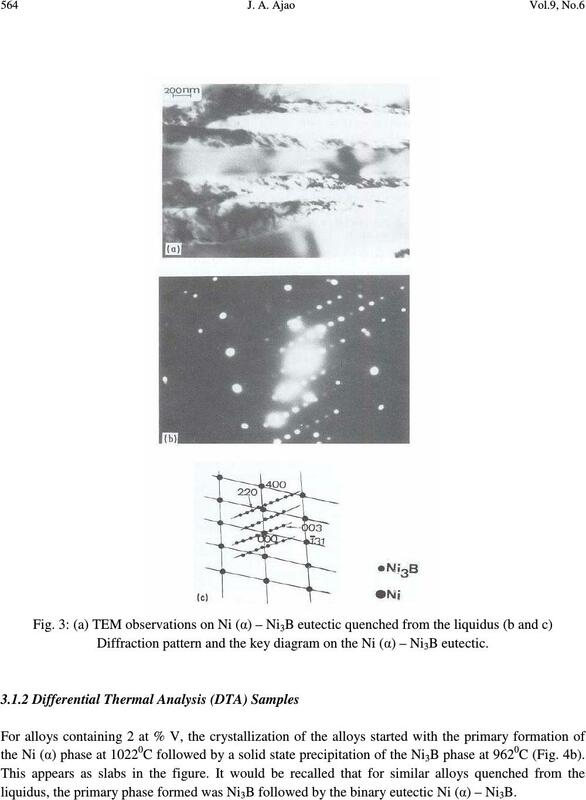 Ni-B alloys – crystallography of Ni-Bi3B eutectic”, J. Mater. Sci. 23: 1112 – 1125. Stadelmaier, H. H. and Balance, G. B., 1967, “The Ni-V-B Ternary System”, Metall. 21, 691-695.
their Bonding Reactions”, J. Vacuum Sci. Tech. 11:798 – 801. (τ- phase) Crystals”, J. Cryst. Growth 58: 647 – 649. Ajao, J. 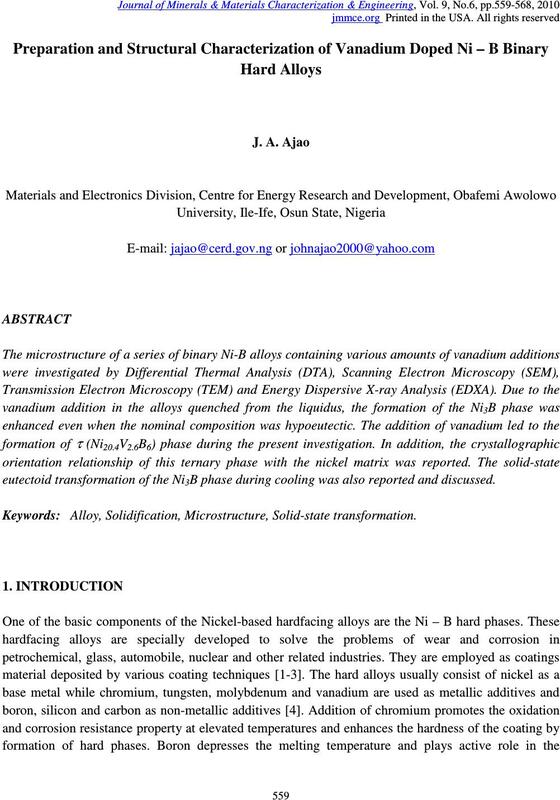 A., 2009, “Phase transitions in some nickel-rich nickel–boron–titanium hard alloys”, J.
Microscopy of Ni-B Meltspun Alloys”, J. Mater. Sci. 24:3647–3659. Verres Metalliques”, Mem. Sci. Rev. Met. 81:553–559.